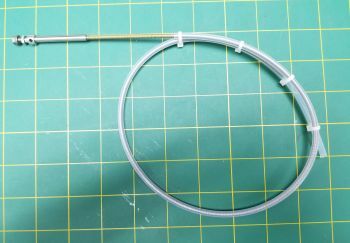 OSE assembled .130 flex cable with 3/16" prop shaft, drive dog, basic nut and teflon liner. The cable in this package is made for propellers that spin clockwise. For example, Octura props that end in the letter "R" or Graupner props that end in the letter "L". Our assembled systems use the latest in assembly technology. We don't heat the cable in our process. This helps solve the breaking problems at the solder joint that other companies have. 7/32 OD K&S brass tubing for stuffing tube when used with the Teflon liner. Cable cut to your desired length.